"I made a short 8k video for YouTube with Red Weapon 8K video camera and it is about 2 minutes long but of 40 GB. I cannot upload something that big. Anyone can tell me how to compress 8K videos without quality loss or the least loss of quality for uploading 8K on YouTube/Vimeo or for playback on iPhone/iPad?" Here is how it happened: A 2-minute video named "Ghost Town" in 8K resolution popped up on YouTube, out of which everyone realized that 8K UHD video really came into view, despite the fact 4K movies/videos has not been entirely prevalent throughout the world. But the thing is, it is nearly impossible to stream or play 8K video on most devices, e.g. TV, PC, Mac, iPhone, iPad, Android, etc at present, unless you compress and reduce your 8K video/footage. That's why we are here talking about 8K video compression/compressor. FYI, if the connection among (8K) video resolution/compression and visual quality is something new to you, check out the following details. Why Should You Compress 8K Ultra HD Video? 1. 8K Full Ultra HD, currently the highest standard of video/display resolution, is co-developed by JVC and NHK, which, well, may not matter to you. The point is, 8K resolution is 4 times the total pixels of 4K UHD and 16 times 1080p HD (8K vs 4K | 4K vs 1080p), meaning, theoretically, if you play a 8K video in full screen on 4K TV, you will only see a quarter of the scene, or the video will auto degrade from 8K to 4K. By comparison, compressing 8K video with UHD video compressor is much more precise, such as compressing 8K video for fully compatible with 4K/1080p display. 2. Worse still, there is barely 8k TV available in the market. High-enough internet speed for streaming, downloading and uploading 8K video won't be there any time soon, for 2-minute 8K video of 40 GB needs 349525 Kbps (341Mbps). Not-compressed 8K video could turn out to be a still image in 4320p resolution. And you need not only a best 8K video compressor, but also 8K video decoder/editor. 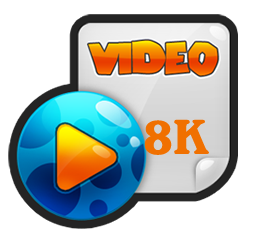 Get Best 8K Video Compressor - WinX HD Video Converter Deluxe Today at No Cost! WinX HD Video Converter Deluxe is an all-in-one 8K UHD video compressor, helping compress and reduce 8K video to 4K, 1080p, 720p, etc in MKV, MP4, M2TS, AVI, WMV and more video formats without quality loss. Plus, it can download and convert 8K video on Windows/10 PC and Mac from YouTube, Vimeo, etc. Just visit WinXDVD's Giveaway Page. Pros: Compress 8K video, so you can reduce 8K video file size while maintaining Ultra HD quality --> better for saving local space, bandwidth, etc --> uploading faster on YouTube --> easier for loading online with no stuttering --> more compatible with portable devices when playback. Cons: Compress 8K video --> your UHD 8K video may look blocky and blurry, for losing too much bit rate/resolution. Note: If you have an 8K video downloader and plan to purchase an 8K TV, then compressing 8K video seems unnecessary. But should you replace your HDTV with 8K TV now? It depends. Stick to HDTV if 1080p movies/TV shows are the mainstream in your daily life. Compress 8K video to 4K/1080p if you want to watch UHD video on 1080p TV, PC, Mac, etc. Really wanna a sneak peak and money is no big deal to you? Then buy it. The key point about compressing 8K video is to adjust (cut down) bit rate. Others, such as video resolution, frame rate, video format, etc, also have a certain effect. • Bitrate: The higher the bitrate, the more fluent the video and the larger the file size (video size = bitrate x time). First, Bitrate should neither be too high or too low. The former only leads to staggering big file size, while the latter one will be against your will of compressing 8K video without quality loss. Besides, some UHD video compressor enables you to choose between CBR (constant bit rate) and VBR (variable bit rate). Simply, to compress a 8K action movie video, use VBR; drama movies, CBR. • Resolution: Changing video resolution also helps compress and reduce 8K video slightly. Considering your display resolution, you can change from 7680 x 4320 to 3840 x 2160 for playback 8K video on 4K TV, compress 8K video to 1920 x 1080 for playback on FHDTV/iPhone 6 Plus, etc. • Frame rate: Relatively, frame rate is of little use in 8K video compression, which always varies from 23.97 to 30 and has to be in line with YouTube/Vimeo uploading requirements. Open the UHD video compressor and click "+ Video" to load your 8K video. Take compressing 8K video to iPhone 6/Plus as a example: go to Output Profile -> Apple Device -> to iPhone Video -> iPhone 6, Plus (H264) -> turn to Video Option/Bit rate (1000), resolution (1920 x 1080), frame rate: 23.97, and all done. Note: Mostly when you choose H264 as the output video codec, bit rate can't be adjusted, which actually is one of the best designs of this 8K video compressor. It auto changes bit rate based on the need of every frame and maximally reduce 8K video file size. Step 1: Load your source video by clicking "+ Video"
Step 2: Go to Output Profile center -> Web Video Profile -> YouTube/Vimeo Video -> MP4 (recommended) -> OK -> Bit Rate -> click "Customize" besides Resolution option and fill in with 7680 x 4320 -> OK. Step 3: Browse to set a destination folder. Step 4: Press RUN button and begin to convert 8K video for uploading on YouTube/Vimeo. 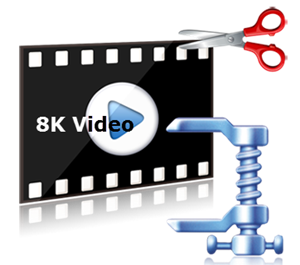 If there is no UHD video stored on your hard drive, you can download 8K UHD sample video from YouTube or download 4K movies videos online using this 8K video compressor. 1. Free download WinX Video Converter below. 2. Hit +Video button to import video source. Select desired output format from popping-up Output Profile window. 3. Browse to set destination folder and then Hit Run button to convert video on Windows 10.